Well, I just realized that it has been quite some time since I updated my blog. That is not how bogs are supposed to work. At any rate, I just returned from my Norwegian Cruise Lines Western Mediterranean Cruise. Everything went well and I came back with a load of pictures. Fortunately for my students there are a several that make great starting points for class exercises. They have real problems that Photoshop Elements (PSE) can fix. I have another guest lecture gig coming up in mid-December that I am looking forward to now. For any of my students who happen to read this, I still do not know my fall schedule for either school. My web site still shows the spring schedule. Once I do, I will update the web site and also send out my usual email for those on my distribution list. One of the reasons I have not added a new entry here is that my discussion of converting catalogs from older versions of PSE to PSE 6 attracted some comments that I tried address. Even with the number of excellent books available for PSE, none really discuss the details of working with the Organizer mode of the program. I really believe there is a market for such a book. What do you think? Those of you who have taken my photo editing classes know that I am a big user of the Levels command and its use on an Adjustment Layer. In the more advanced class we learn about how to use the gray eyedropper to help correct the color balance by clicking on something in the photo that should be a shade of gray. But what if there is nothing in the image that is neutral gray? How many of us shoot a test shot with a gray card in the scene? I learned a new twist to this technique from the free e-magazines available from www.photographybb.com. I think it was in Issue No. 2. By the way, this web site has a wealth of information and is an excellent source for free actions that run on PSE. The article that I adapted my approach from discusses several techniques to correct color. I have been using the approach outline below that is based on the discussion in the above article to work with some of my problem photos from my cruise. Here are the basic steps. On the Background Copy layer, click on Filter > Blur Average. That layer now takes on the color cast of the photo. Well balanced photos will be gray. Select the Eyedropper Tool from the Tool Box and sample the Background Copy Layer, setting the Foreground Color Swatch to the sampled color. Delete the Background Copy layer. Open the Levels command on an Adjustment Layer. Click on the Gray Eyedropper in the Levels dialog. Click on the Foreground Color swatch – the top square at the bottom of the Tool Box. The color cast should be removed. Click on the Auto button within the dialog box to set the white and black points for proper contrast. If required you can use the middle sliders in the Levels command dialog box to fine tune the brightness, contrast, and color of the image. However, I have found that for a large number of my pictures, the Auto button is all I need. I do not use the above steps for all of my photos, only those that have a definite color cast. When they do, I have been using it recently, instead of adjusting the sliders on the red, green, and blue color channels. Below is a before and after example. 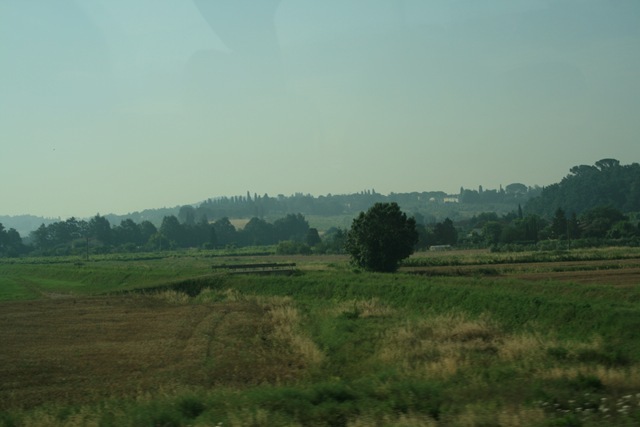 This photo was taken of the Italian countryside on the way to Florence through the tour bus widow. Here is the original. A definite green color cast is evident. Still not that great of a photo, but at least it is worth keeping now. Try this technique and see what you think. It is working pretty well for me.